Well, I've turned over the AdventuRides Keys to Carole. 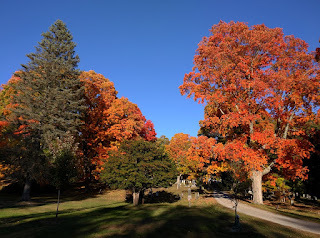 The foliage in Hollis and Brookline should be excellent! Breen's Diner or something else. Sorry, late again... The next few weeks will feature rides from opposite days earlier this season. For example a Friday Afternoon Recreation Ride from September will be repeated this Monday morning. Well, there will definitely be a nip in the air tomorrow with temps around 40 in the morning and 50 in the afternoon. It should also be SUNNY and not very windy. The Morning Recreation Ride will take us to Heart Pond, Genuine porcelain bathrooms at Great Brook Farm and back through scenic Carlisle. Friday's forecast is much like Monday's weather. It should be SUNNY, chilly, and breezy in the afternoon. The Afternoon Recreation Ride will take the Assebet River Rail Trail to Stow and go "BOOOOOOO" when we pass Honey Pot Orchards since they are blocking completion of the Rail Trail. Unpaved - a few miles of unpaved rail trail. This Week - MeadowBrook - TBD - Lunenburg? Monday looks SUNNY but COLD. It was snowing when I scouted out the route today. It should be mid 30s when we leave and mid 40s when we return. At least is not supposed to be windy. DRESS WARMLY. We will start at Meadowbrook Orchards in Sterling. They have breakfast, coffee, donuts, PORCELAIN, lunch, and take home goodies, everything a biker could want! And its WARM inside. The Morning Recreation Ride will zip over to the Wachusett Dam, then ride along the Nashua River before turning UP to Lancaster. The foliage in Lancaster is spectacular and the route takes us by some nice farms and woods before returning to Meadowbrook. The Afternoon Fitness Ride will go to the Old Stone Church on Wachusett Reservoir where I had trouble getting through all the photographers today. It's seriously beautiful. Then we will ride to Sterling on the MCRT and then down the wide shoulder of Route 62 back to Meadowbrook. The latest forecast shows SUNNY, temps near 60, and a bit breezy in the afternoon. Of course its Filho's for LUNCH. Route Map - Groton - Squannacook. Unpaved - a bit of gravel / dirt. Route Map - Groton - Baddacook - Dunstable. Unpaved - a bit of gravel. I haven't figured out the routes yet, but I will say the Fall foliage should be spectacular. Forgive the messed up formatting. I am in Bar Harbor. Route Map - Westminster - PrincetonDistance - 25 miles.Elevation Gain - 1500 feet.Unpaved - 3 miles (generally smooth).AR Index - Roughly equal to 35 flat smooth miles. RSVP to Carole if you are interested! Our intrepid rider, Darlene, has some fun suggestions. Thought you might want to post the Boston Bike Film Fest to the group. I'd be interested in going with others. I can hear playing them now from my office. The main events are Sat from 1 to 9 in Davis Sq and Sun 12 parade from Davis to Harvard, bands in Harvard Sq from 2 to 6. This is absolutely my favorite weekend in Somerville every year!! The weather is not looking good tomorrow, especially after noon. So, we are going to start closer to home and with lunch inside if its raining. The Morning Fitness Ride will go around Keyes Pond, Nabnassett Pond, and Stony Brook. The Afternoon Recreation Ride will go to Westford Center, Burge's Pond, and Stony Brook Reservoir. I haven't figured out the exact routes yet, but I wanted to give everyone a heads up on the starting point. Stay tuned for updates. The weather for tomorrow looks PERFECT, so Nearly Fearless Leader will lead a ride to Davis Square from Bedford Depot on the Minuteman Bikeway. Friday's weather is not looking so good and Monday is a holiday, so get out and enjoy the Fall foliage! Dave's Fresh Pasta - Delicious Panini, etc. If you enjoyed the weather today, you'll enjoy the similar yet somewhat warmer weather tomorrow. It should be partly cloudy and 50 degrees in the morning and 60s in the afternoon with light breezes. The morning Recreation ride will go to Littleton's Long Pond, we'll try out the newly paved Nashoba Road, and stop at Nagog Orchards before returning. 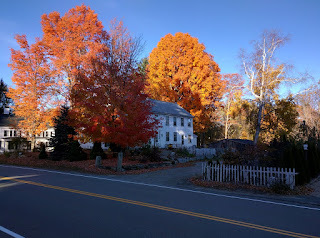 The afternoon Fitness ride will travel UP to Hill Road and the old Schoolhouse, then its DOWN to Boxboro Center. We will pass Minuteman Airport on our way to South Acton before returning. Route Map - West Acton - Nagog. Route Map - West Acton - Schoolhouse. On Friday, October 2nd - Pepperell Rotary. Sorry for the late notice. Friday doesn't look like a good picnic day, so I changed the ride to Pepperell Rotary. OK, here is the scoop for tomorrow's rides. The weather is supposed to be Cloudy, Windy, and Chilly. The routes are nice though! We can get food at C&S Pizza across the rotary from our meeting spot. Route Map - Pepperell Rotary - Hollis, NH.